Due to the rapid degradation of the mold used to create these egg molds, these molds are no longer in production. The closest replacement is here. Sorry for any inconvenience! Need some eggs for your oviposition fantasy? 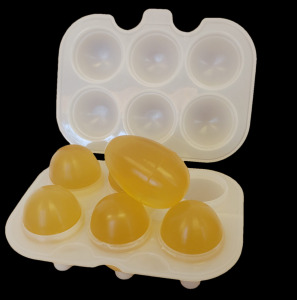 Our specially designed egg mold will make 6! Each egg measures 1⅝" x 2⅝". Simply snap them together, fill them with plain gelatin using our recipe found here, refrigerate, and enjoy! Made from USDA approved plastic. Note: the eggs from this mold are NOT for use with the Squick. Attempting to use eggs from this mold will damage the Squick. Yes. They are designed to withstand boiling and freezing.